So things have been very busy for me lately and work has definitely cut into my pizza reviewing time, but the good news is eating less pizza has been kind to my waistline! 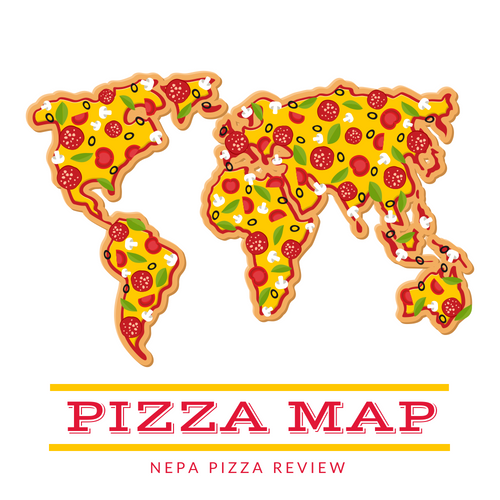 Have no fear, the summer of 2013 will be the summer of the NEPA PIZZA REVIEW! Until then, I will continue to bring you one review per week, but just understand that I want to do more, more, more! 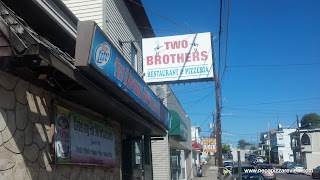 So I've received a few suggestions from readers and personal friends to go try out Two Brothers Pizza in Dunmore and I figured why not get there and finally review the pizza. Two Brothers is on Drinker Street in close proximity to another great place, Cara Mia's. I phoned in my order and arrived about 20 minutes later to find that it was ready to go for me. I always appreciate a pizza that's on time! When I walked into the place, I entered the bar area first and I got a very casual vibe from the place. The green and red painted paneling kind of gave it a festive feeling and made me think it would be a cool place to hang out to catch a game and have a conversation with friends. The dining room was also quite casual and had maybe ten tables or so to eat at. The place had an eerily familar feel to me, but I don't think I've ever been there before. Whether I was there in the past or not, I was there to review the pizza, so let me get to it! As I lifted the 18 inch pizza box, I felt that the contents were quite heavy which could only mean one thing - a hearty pizza! I paid for my pizza and quickly returned to the Pizza Mobile to snap a few pictures and get my first impression. I noticed that this was a thicker pizza - I'll call it a New York style pizza for simplicity, but I'd call it more of a Neopolitan given that it's really not a thin crust. I noticed that there was plenty of sauce and cheese, and it looks like I received a pie that was both prepared and cooked as perfectly as the pizza maker could have put it together so I think this review will be a good representation of what Two Brothers serves. I was totally starving so I dove right in although is was not easy to pick up one of the sauce and cheese packed slices and keep it off my shirt and my car's interior. Once I finally got a good hold of the monstrous slice I took notice of the crust first. As I said it was quite thick and it reminded me of a pita bread or something similar. It was soft and somewhat dense, and was definitely cooked on a metal screen in the oven as I could see the distinct pattern in the underside of the crust. The sauce was among the heartiest I've ever encountered here in NEPA. It reminded me more of a spaghetti or marinara sauce rather than a pizza sauce, which made this unique. It was well seasoned and balanced, was not sweet at all, and had a slightly chunky consistency that held together nicely. I know for sure I would have enjoyed this pizza sauce over a steaming bowl of penne pasta, but I did enjoy it on the pizza as well. The sauce was the component of the pizza that stuck out the most to me and certainly is the thing that distinguishes this pizza from others. The combination of the bread-like crust and the marinara-like sauce, I got the sensation of a breadstick that was pre-dipped in sauce which was pretty neat. 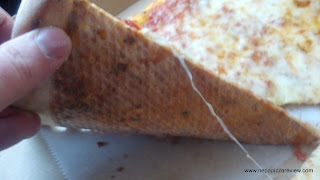 Since the sauce was so hearty, it provided a nice separator between the dough and cheese. 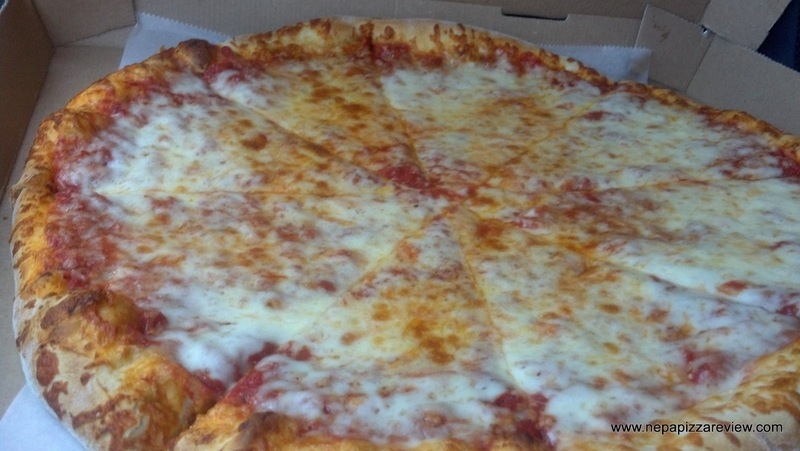 Many pizzas end up flat and dry because the sauce isn't hearty enough and the cheese sinks down into the sauce and dough. These types of pizzas have a very short shelf life and typically don't reheat well the next day. If I had to guess, I'd surmise that this pizza is very good as a leftover pie. Finally, the cheese seemed to be a standard mozzarella (or blend) which simply got the job done and held the pizza together while providing some balance. Overall, I did enjoy this pizza and I'm glad I tried it because it's something different in the area. Two Brothers has certainly created a unique product that is sure to be enjoyed by many. 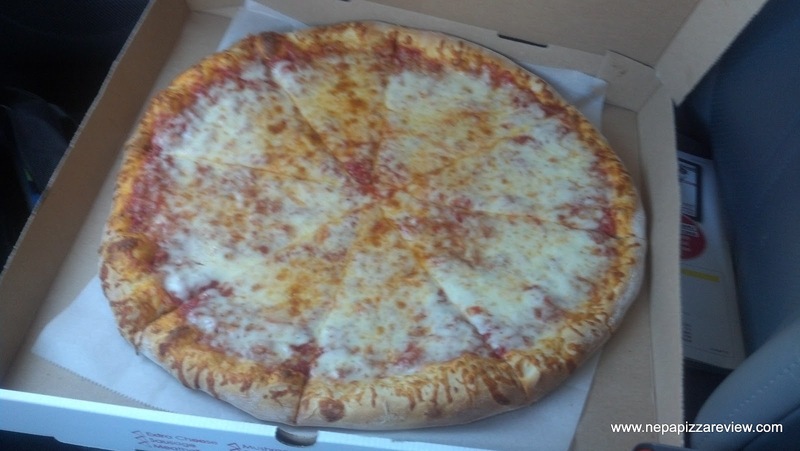 The 18 inch pizza is a great value, given that it's nearly impossible to eat more than two of the hefty slices. I would recommend this pizza to those who like a hearty sauce or those who are looking for something a little bit different so head down to Dunmore and check it out!